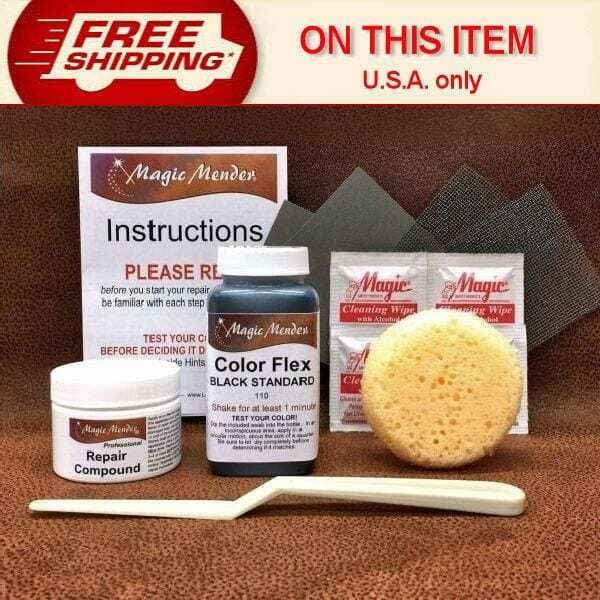 Do Leather Repair Kits Really Work? Repair & Recolor everything you’ll need. All you need to do is choose your color. See tabs below for further information. No color mixing: Our colors are ready-mixed for you, no messy mixing. Every color is custom mixed as your order is processed. Works on: Coated or Protected Leather, Coated Aniline Leather, Bi-Cast Leather, Bonded Leather and Vinyl. Dries into a flexible Satin finish. See our Clear Coat page for other available top coat finishes. Repair: Pet damage – Wear – Fading – Cracking – Cuts – Tears – Cigarette burns and more! Recolor: Stains, scuffs, faded and worn areas..even change colors. Suitable for Use On: Furniture, auto interiors, shoes, purses, briefcases, equestrian leather and much more! Safe for Use On: Vinyl and all leather except for suede or Nubuck. This is the easiest method. No need to mask most projects. 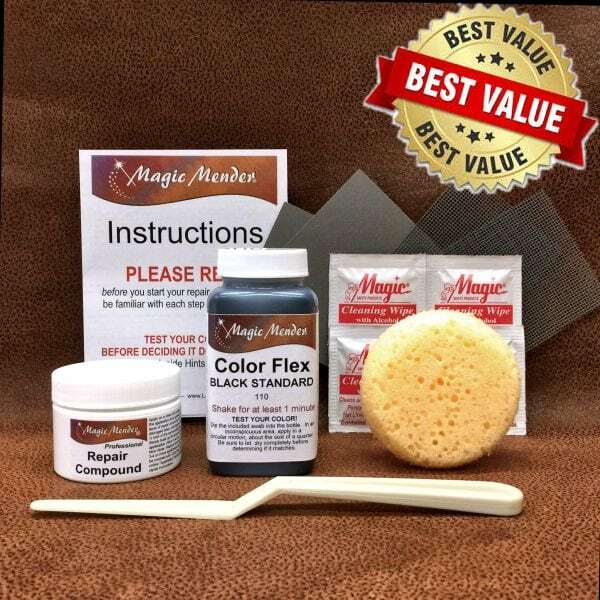 A sponge comes with our All-in-One Repair Kit and with our individual bottle of Color Flex. Foam brushes are best for small, hard to get to places. You can purchase them here. If your prefer to spray on our Color Flex, you can use a Preval Sprayer. It’s a portable aerosol unit that attaches right to our 5 oz bottle. Sorry but we don’t sell these because they cannot be shipped by air and we only ship Priority Mail. They can be purchased at most hardware stores. If you already own an air brush, you can use it instead of the sponge if you prefer spraying on the Color Flex. Estimating coverage can be tricky. Much depends on the condition of the surface the Color Flex is being applied to and the color itself. For most small projects our 5.1 bottle is more than sufficient. A good comparison that most people would be familiar with: A typical 12 oz aerosol can holds approximately 3.4 oz of color, the rest is solvent and propellant. Lighter colors (colors that contain white) will cover better than colors that contain more transparent tints like red. Shades of red typically require more applications. We double the tint base to combat that but please be aware that shades of red may not cover as well as the stated areas below. Store in a cool, dark place with the lids tightly fastened. Make sure that the edges of the containers are clean and free of any debris. Stored properly, products should last for several years without degrading. If the Color Flex thickens, you can add some Clear Coat to it to bring it back to its normal consistency. If air gets to the repair compound, it will cure making it unuseable so keep it tightly closed.